Our Guest is Avril Dalziel Saunders, an author who turned to writing after retiring from her job in Television for Thames TV at Teddington Lock. Avril is the author of Chasin' That Carrot. Q1. Can you tell us a little about yourself and your book? Born and raised in Glasgow after the 2nd World War. Life was a struggle but my brother and I were privileged to be brought up with the things money can't buy, love, honesty and respect. I ran the sales office of an international company in Glasgow, moved to Surrey in 1971 with my husband and baby son, later blessed with two daughters. I worked for Thames TV in London. I'm now a grandmother of three with another on the way. I'm retired and enjoy spending time with my family, writing, music, travel, theatre and the arts. I wrote a novel about how a young Glasgow girl faced up to the challenges that life threw at her in the 50s & 60s. Readers asked me to write a sequel, hence 'Chasin' that Carrot' was born, it tells of the struggles and successes of my character Linda MacGregor and her husband as they 'Chased that Carrot' 400 miles away from the safety and love of their families. Q2. Where does your inspiration come from? My late dad, his letters were always well composed, detailed and a joy to read. I hope I have inherited this gene from him. He was also a wonderful storyteller and used to have my brother and I engrossed with his tales. Also my dear friend, the late Vince Powell encouraged me to go ahead and get published. Vince and I worked at Thames Television, he was a very successful writer, he wrote for 'Coronation Street' and the 'Carry on' Films in the early years and penned classics like, Bless this House', 'Love The Neighbour' 'Mind Your Language' and many more. I mentioned to Vince that I had written a potential book but it was still in manuscript form, he asked if he could read it, he called me up a few days later and said 'Congratulations Avril, this is very, very good and deserves to be published!' If it wasn't for him my manuscript might still be lying unpublished, gathering dust. I was walking on air after that and the rest is history. Q3. How do you develop your plotlines and scenarios? I like to write about real life experiences, my stories are taken from memories of different scenarios that I have either witnessed, read or heard about. I alter them to fit into the storyline and period of time. Reminiscences of being born after the Second World War and growing up in the fun filled 50s & swinging 60s also helps to develop my stories. Q4. How have you reacted to the brilliant reviews for your book? With sheer delight and gratitude, it is a great honour to know that my books are being sold and enjoyed worldwide. I appreciate it very much when readers take the time to either write a review or contact me with feedback. It makes my efforts worthwhile when readers contact me to say that they can relate to everything I have written. Q5. How do you promote your work? Local newspapers, radio station, Arts Magazine for Reunited Thames TV Staff, webpage (where readers can purchase signed copies), message boards, Facebook, Twitter, Friends Reunited, souvenir pens with my name, book title and ISBNs. Signature promos on my emails, courtesy calls to UK bookshops e.g.Waterstones to remind them to keep stocks up. GlescaPals messageboard. The admin and members have given me great encouragement and support worldwide. Q7. Are you concerned about the effect of e-publishing on traditional books? Yes, I am concerned, although after speaking to many people I have come to the conclusion that they either love them or hate them, there's no in-between. Majority said they prefer to hold a proper book (especially a signed copy). I do more promotion online e.g. emails, posting on social networking sites etc. I prefer this as making calls or visiting bookshops can sometimes be time consuming. Q9. What has been your publishing experience? It wasn't easy, as an unknown author, I spent a lot of time and effort, especially on promoting my work, but the good reviews, readers letters of thanks as well as seeing my book on display in Waterstones, and stocked by local libraries makes all my efforts worthwhile. Q10. What other work have you written, both published and still in the pipeline? 'What's for Ye, Won't Go By Ye' (2006). Sequel 'Chasin' that Carrot' (2008). Another follow-up is in the pipeline, so watch this space! 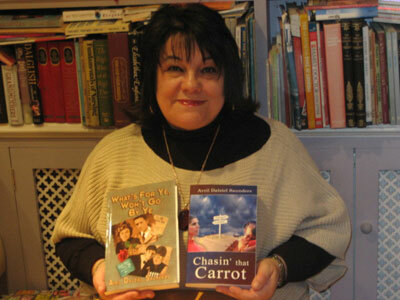 Find out more about Avril Saunders' Published book: 'Chasin' That Carrot'.